Sign up as teams of 2. You will be provided with a table, you can set up a stall of any food that reminds you of Namma Madras Beach. The best dish wins an exciting prize! Register before August 24th 2017 on 98404 21305 / 2431 2676 . 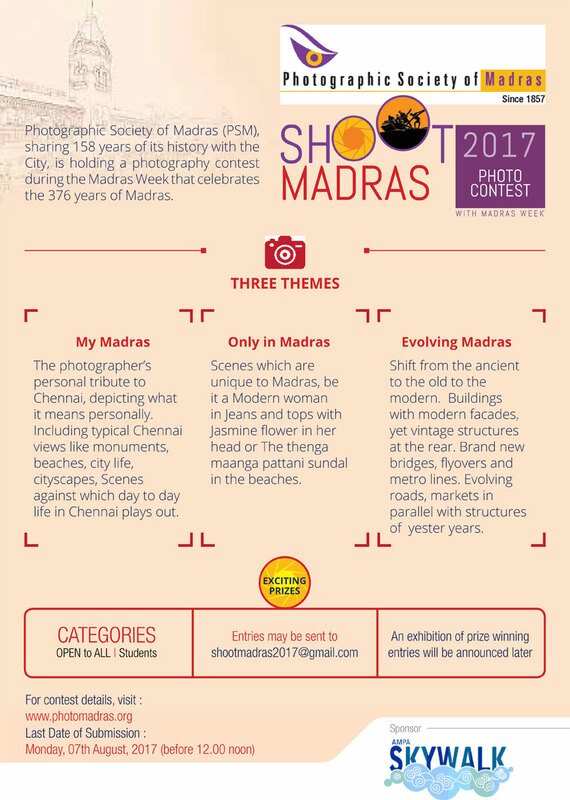 Photographic Society Of Madras (PSM) is holding a photography contest to celebrate Madras Week. The exhibition of the winning photos of ShootMadras 2017 would be held at Ampa Skywalk, No. 1, Nelson Manickam Road, 627, Poonamalee High Road, Aminjikarai, Chennai, Tamil Nadu 600029, during the Madras week, for three days from 23-26 August 2017, with the award ceremony at 10 am on 26th August. 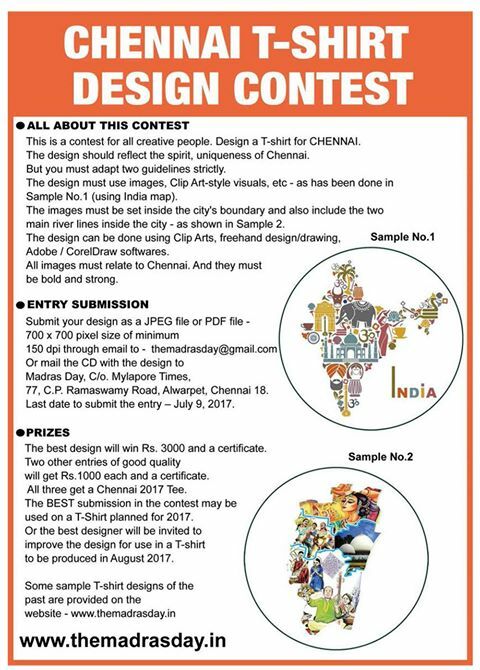 This contest is held in connection with Madras Day 2017 which celebrates our city. 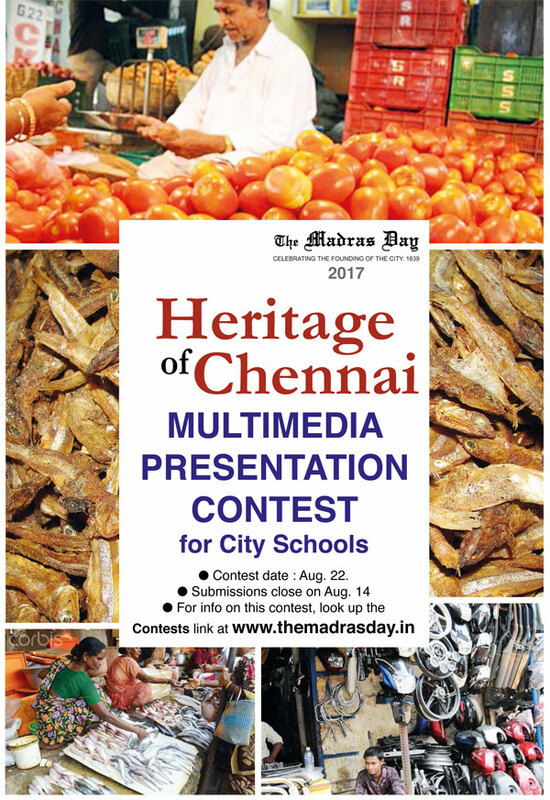 The contest encourages city school students to explore Chennai’s heritage and present the topic given to you in multimedia form. This contest has been held for 14 years. 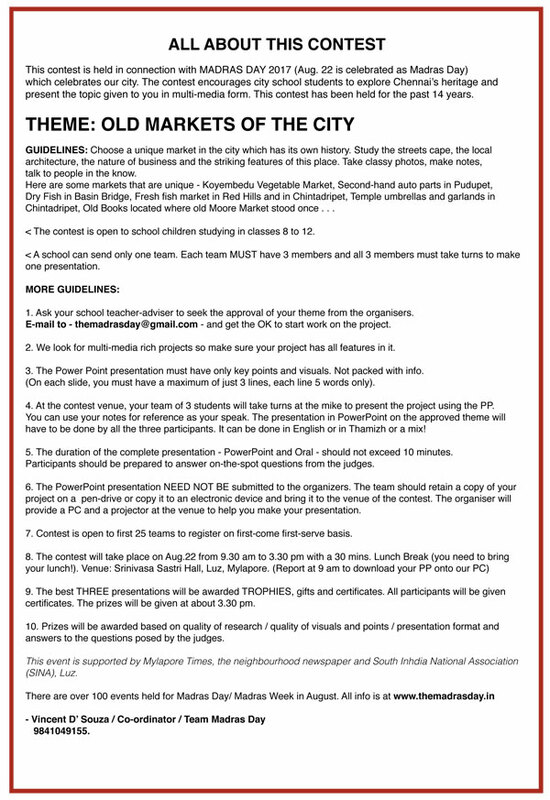 This year’s theme of the contest is Old Markets of the city. Choose a unique market in the city which has its own history. Study the streetscape, the local architecture, the nature of business and the striking features of this place. Take classy photos, make notes, talk to people in the know. Please refer the rules of the contest in the poster below. The contest-presentation need not be submitted to the organisers. But ask your teacher – adviser to seek the approval of your theme by emailing to themadrasday@gmail.com before you start working on the project. The contest will be held on August 22, 2017, from 9.30 a.m. to 3.30 p.m.
Venue: Srinivasa Sastri Hall, Luz, Mylapore, Chennai. The event is supported by Mylapore Times, the neighbourhood newspaper and South India National Association (SINA), Luz, Chennai. 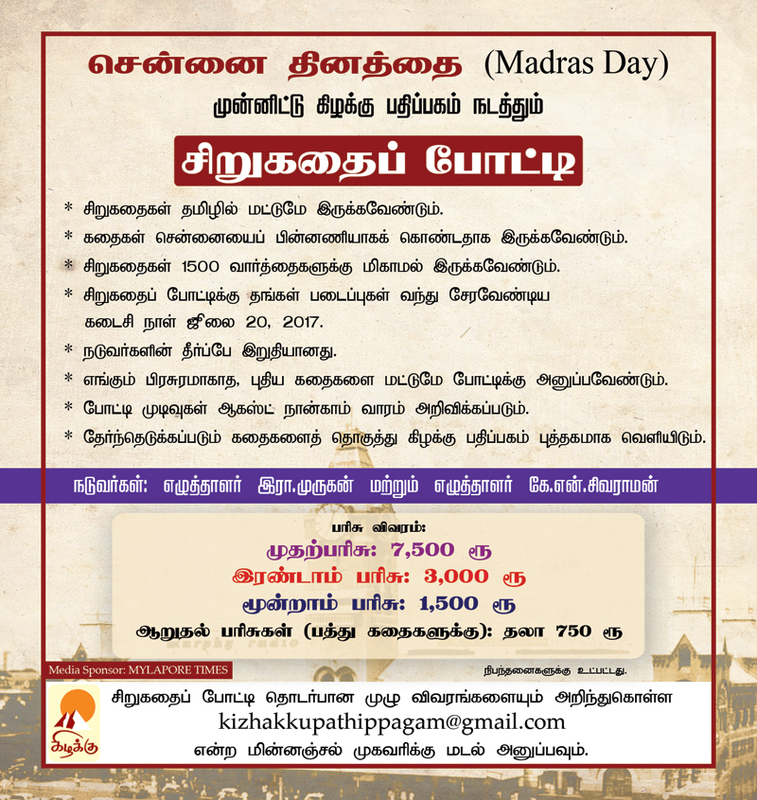 The Senior Citizens Group of Besantnagar (SCGOBN) announces an essay competition for Senior Citizens to coincide with Madras Day. The topic is – What relevance does Madras Day have for me in my twilight years? The competition is open to all senior citizens all over India . Participation is free. Entries to be sent by e mail only to scgobn@gmail.com in word format. Word limit is 1000 words. Last date is 30th July 2017. The essays would be evaluated by a panel of retired bureaucrats, corporate executives, professors and social workers.Ten best entries will be selected for ten prizes.Prizes would be awarded at a public function during Madras Week. SCGOBN is a social service group of sr citizens (avarage age 70) who share Gandhian values of truth, honesty, ahimsa, compassion, simple living and high thinking. Corporate Houses/NGOs interested in either sponsoring the function or prizes may contact Prof V.Chandrasekhar 9884224480 scgobn@gmail.com. SCGOBN does not accept monetary donations. Kizhzkku Pathippagam is hosting a Short Story contest for this Madras Day. Stories must have Chennai/Madras as its character/ landscape or set in Chennai. Last date to receive the entries is July 20, 2017. How your family moved to Annanagar, when? How? Why? How your family history is related to Annanagar.